The mighty Rhine cuts a course through the heart of continental Europe, flowing through enriching capitals and regions of untold natural wonder. 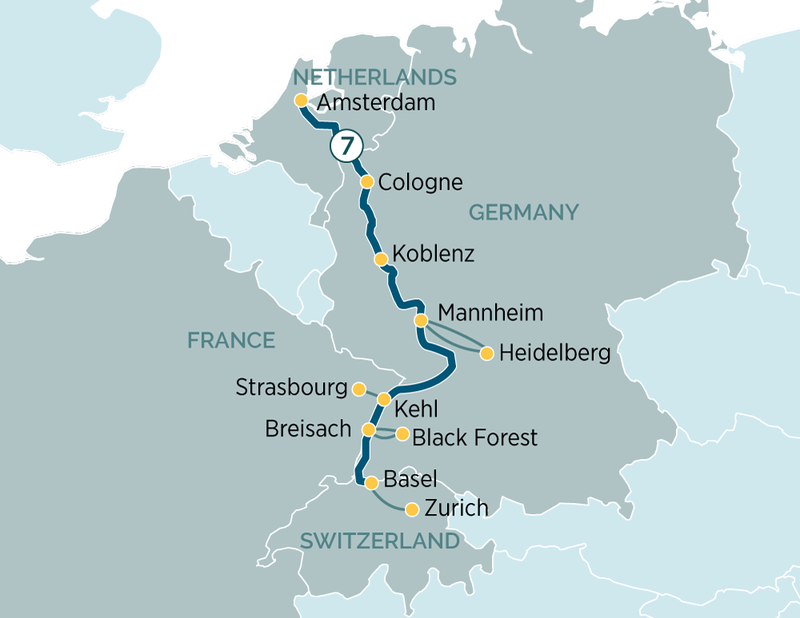 A journey on this majestic passageway provides a gateway to some of the continent’s most esteemed destinations and beauty spots, from Amsterdam, Cologne and Strasbourg to the Black Forest and the Rhine Valley — helping you uncover many of the river’s highlights in a single journey. The itinerary begins in Amsterdam, and sees you travel upstream through the Netherlands and into Germany, where you’ll enjoy daily stops in Cologne, Koblenz, Mannheim, Kehl and Breisach, before crossing into Switzerland for a final day in Basel. Of course, your tour includes several unforgettable Rhine river excursions — from a guided bike tour in Amsterdam to a scenic walk through the fascinating medieval town of Heidelberg. Welcome to Amsterdam, a fascinating 700-year-old city of picturesque canals, world class museums, theatres and cafés. You will be met and transferred from the airport to your Emerald Waterways luxury river cruise ship. This evening, join your fellow travellers for dinner on board. Your Cruise Director will also conduct a port talk to review the activities and itinerary for the days ahead. Cruise along the Rhine River to Cologne, founded by the Romans, the city is one of Germany's oldest and is famous for its magnificent World–Heritage listed Gothic Cathedral. After lunch on board, join your local guide for an included tour of the Old Town, with free time for exploring. Cologne is one of Germany's largest and most modern cities largely due to a rebuilding plan post WWII, and it has many different museums and galleries. Cruise to the 2000-year-old town of Koblenz, which is situated at the confluence of the Rhine and Moselle rivers. You will have a tour of Koblenz and visit the Ehrenbreitstein Fortress on the opposite side of the river. This fortress was part of the Prussian defences against the French in the 19th century and later used as a headquarters for the American military during WWII. In the afternoon, sail through the spectacular Rhine Gorge, passing countless castles and vineyards as well as the infamous Lorelei statue and Pfalzgrafenstein Castle, which was built on an island in the middle of the river as a medieval toll station. Countless vineyards and medieval castles line the shores of this section of the river, with photo opportunities at every bend. Continue upstream to the town of Mannheim, located at the confluence of the Rhine and Neckar rivers. There you will have a chance to either visit the medieval town of Heidelberg including the impressive castle which overlooks the town or take part on an active hike to Heidelberg Hill. Once docked in Kehl you will be transferred by coach across the river to Strasbourg, the capital city of the Alsace Region in France. Your guided walking tour will include the Grande Île, the historical city centre and UNESCO World Heritage Site known for its medieval black and white timber framed buildings, old tanning houses, baroque sandstones buildings, canals and river locks. Today you will visit a typical black forest village, full of charm and many Cuckoo clocks and other German specialties. Alternatively, take part on a guided hike through some of the black forest trails. Welcome to Switzerland and the Rhine–side town of Basel, the centre for Switzerland's pharmaceutical industry. After, your breakfast you will disembark your ship and transfer to the airport in Zurich for your homebound flight.